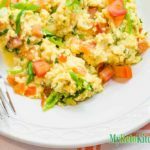 Keto Scrambled Eggs - Low Carb Breakfast - Easy Healthy Start To The Day! Spicy Keto Scrambled Eggs will give you just the kick you need to get moving in the morning. Place the butter into a large non stick frying pan over medium heat. Add the chili and tomato and sauté for 2 minutes. In a bowl, whisk together the eggs, cream, cilantro, salt and pepper. Pour the egg mix into the frying pan and gently agitate the edges with a silicon spatula, then draw it through the center. Allow the egg to set around the edges before repeating, this will give you lovely soft curds of scrambled egg. Continue to cook the scrambled egg until it is soft, but no runny egg remains.